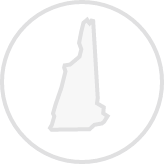 Create a legally binding New Hampshire Bill of Sale with our attorney-drafted template! What Is a New Hampshire Bill of Sale? A New Hampshire bill of sale is a document that exchanges the legal ownership interest in an item from the seller of the item to the buyer. A New Hampshire bill of sale does not need to be notarized. What Are Some Common Bills of Sale Used in New Hampshire? The most common bills of sale used in New Hampshire are the general bill of sale, bill of sale for a motor vehicle, a bill of sale for a boat, and a bill of sale for a gun. How Do I Write a New Hampshire Bill of Sale? Writing a New Hampshire bill of sale is straight forward. However, under New Hampshire state law, a bill of sale for a motor vehicle or a boat cannot have a PO Box for the buyer or the seller. Instead, it must list the physical address of each party. Every bill of sale needs certain information. The difference between the most common bills of sale used in New Hampshire is found in how the items are described. First, we'll talk about the information that belongs in every New Hampshire bill of sale. Then, you'll learn about the proper way to describe items in the most commonly used ones. First, a New Hampshire bill of sale should have the date that it was created. You can place the date at the top of the document or you can work it into the first few lines. 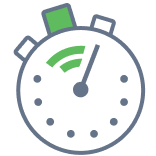 If the buyer will pay for the item on another day, you should list that date in the area where you discuss the price. The final date is the date listed by the signatures of both the buyer and the seller. Next, you'll list the legal name of both the buyer and the seller. You'll also need to list the address of both parties. Remember that for a bill of sale for a motor vehicle, New Hampshire state law specifies that you cannot use a PO Box as an address. You must list a physical address. The next section in a New Hampshire bill of sale is a description of the item. You'll learn more about how to properly describe the item later in this section. After the item's description, you'll write the terms and conditions of the sale. For example, you would list whether the item is given as a gift, part of a trade, or being paid for with cash. If there are other conditions for the sale, they should be listed. For cash sales, the amount of the sale should be written in words and then in numbers. For example, five-hundred and twenty dollars and no cents ($520.00). This is also the section where you'd list the date the buyer will pay for the item if it is different from the date the New Hampshire bill of sale was created. You could also include a seller's disclosure. This informs the buyer of any known defect. You can also use this section to tell the buyer that the sale doesn't have any sort of warranty and is considered an "as-is" sale. Finally, a New Hampshire bill of sale should be signed and dated by both the buyer and the seller. 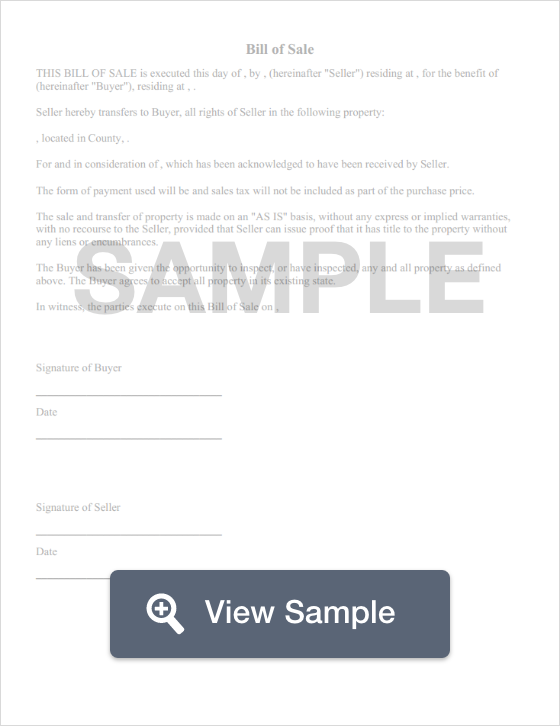 Since a bill of sale acts as proof of purchase, both the buyer and the seller should keep several copies of the finished document for their records. A New Hampshire general bill of sale is used if you're selling an item such as a television, used laptop, jewelry, furniture, or essentially a piece of personal property that isn't classified as a motor vehicle, a boat, or a gun. When you're describing the item, you should list any serial number, registration number, or other identifying number. You can also describe the item by make, model, year, size, color, or material. For items like laptops, you could use the brand, model, year, size of the hard drive, and how much memory it has. Under New Hampshire state law, you must include certain information about the vehicle. That information is the make, model, and model year of the vehicle; the color; the VIN; the year it was manufactured; body type; and the number of cylinders. Remember, this particular bill of sale must include the physical address of both the buyer and the seller. You cannot use a PO Box. Under New Hampshire state law, a New Hampshire bill of sale for a boat must include quite a bit of information. You must include the existing bow number (if any); year and make; the color of the boat (if the boat has more than one color, you list the main color first and then the other colors); the length; the main state the boat will be used in; the material of the hull (such as fiberglass); the type of propulsion system (such as gasoline); Hull ID; whether the boat has single or twin engines' whether the boat is used on inland or tidal waters; the maximum capacity listed by the manufacturer; a signed commercial affidavit if the boat is for commercial use; whether the boat has a toilet, sink, or shower; total horsepower; the primary use of the boat; a statement that certified everything you listed is true; the owner's name, address, and date of birth. Like all other bills of sale, it should be signed and dated. A New Hampshire bill of sale for a gun should include the make, type, caliber, and serial number. Remember that if the exchange of ownership involves a trade, you should describe the traded item, too. Is a New Hampshire Bill of Sale Required to Register a Motor Vehicle? You only need a New Hampshire bill of sale to register a vehicle if you're registering a title exempt vehicle purchased in a private sale. Otherwise, you need a signed title. You must be prepared to pay the fees associated with registering your vehicle. Is a New Hampshire Bill of Sale Required to Register a Boat? Yes, you need a New Hampshire bill of sale to register a boat. You'll also need a completed Boat Registration Form. You may need a verification of vessel identification. You should also be prepared to pay your fees. Is a New Hampshire Bill of Sale Required to Register a Gun? No, you do not need a New Hampshire bill to register a gun. Guns are not registered in New Hampshire. Create a free New Hampshire Bill of Sale in minutes with our professional document builder.